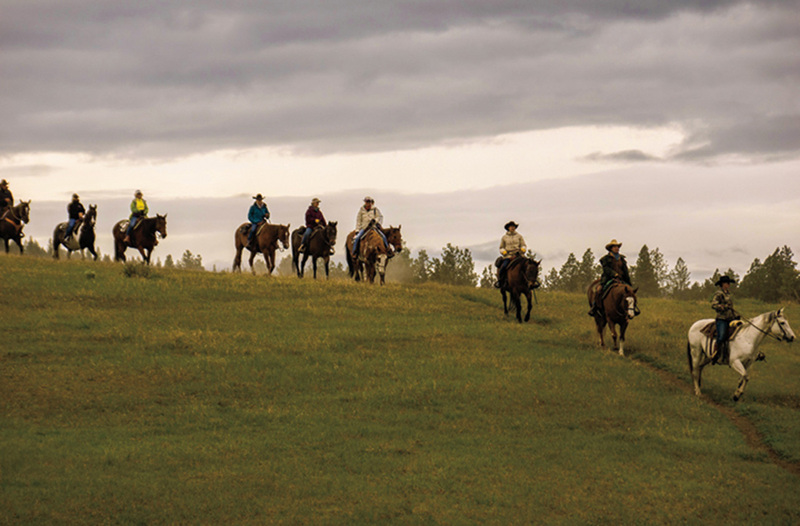 At Paws Up resort in western Montana, outdoor adventures come with a side of self-discovery. Guests in search of R&R can get massages, facials and other body treatments at Spa Town, a cluster of white canvas tents situated in a secluded field on the resort’s grounds. Vacations are meant to free us from stress, and so I’m seriously questioning my choices as I stand paralyzed on the edge of a wooden treetop platform, peering through welling tears at the ground some 40 feet below. Crisscrossed around me is a harness and a labyrinthine system of straps and carabiners, which connect to a state of the art magnetic bungee cord. Behind me, a suntanned activities guide patiently coos words of encouragement. All that’s left for me to do is take a single step forward and enjoy a few seconds of free fall before the magnets snap into action and slow my descent. But terror has taken over, and my feet are frozen in place. It’s the last afternoon of my stay at Paws Up, the sprawling wilderness resort in Greenough, Montana, and that single step forward is all that stands between me and the end of the resort’s new aerial ropes course, which I’m among the first guests to use. 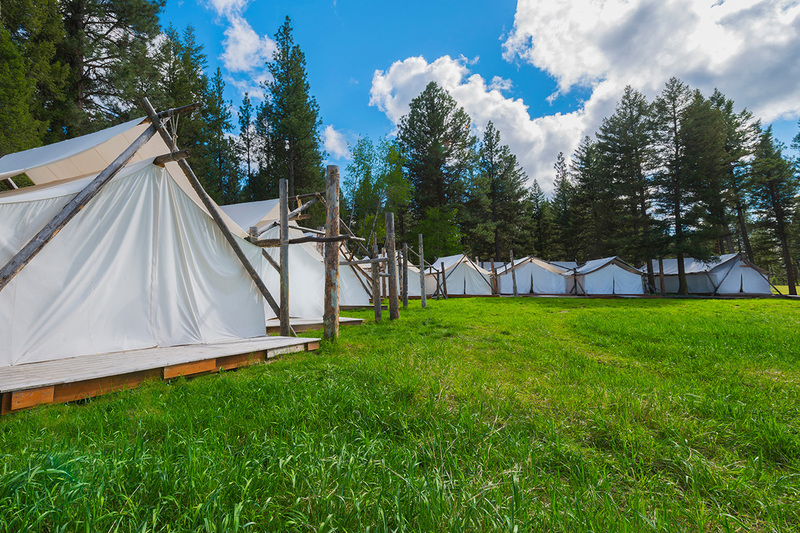 Paws Up has been on my travel bucket list since it opened 10 years ago, a dream escape for its myriad soft outdoor adventures: fly fishing on the Blackfoot River, hotair- balloon rides over the Montana landscape, nature walks through windswept meadows, repelling down rock cliffs. In all the years I’ve spent picturing my own visit to the resort, the all-consuming terror I feel in this moment somehow never factored in. And yet, during my short stay in this beautiful place, with its luxurious tents and log cabins and crackling campfires, living outside my comfort zone has quickly become a theme. 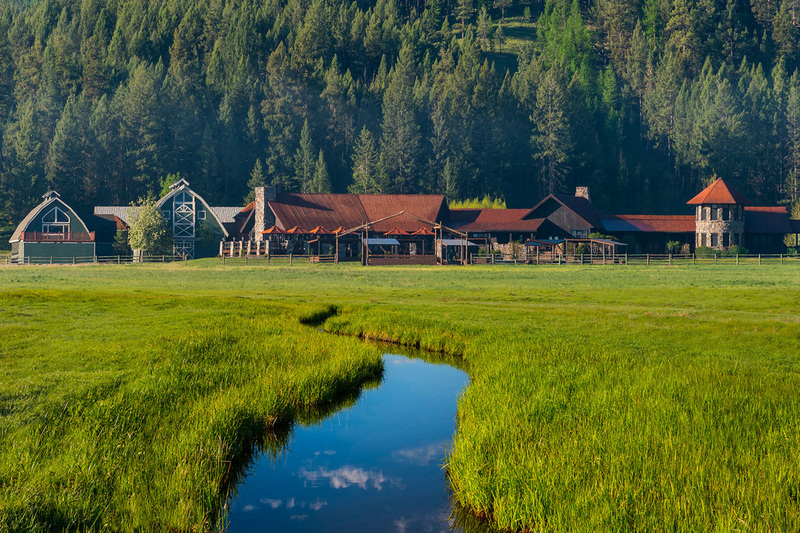 Big Sky, emerald pines and utter tranquility encourage guests to unplug and enjoy the resort’s natural beauty. For all of the resort’s plush comforts, this is a place where mindful travelers can come to revel in personal challenges. The ropes course is not my first. The previous day, I’d sat in a circle with a handful of other guests, glasses of wine and plates of snacks perched at our sides, a fresh, blank leather-bound notebook lying open in each of our laps. At the head of our circle sat New York Times bestselling author Laura Munson, who’d come to Paws Up from her home in Whitefish to lead a series of writing workshops at the resort. What seemed at first like a golden opportunity for a writer and editor like myself became an exercise in the act of disappearing when Munson instructed us to 1) write a free form poem and 2) read it out loud to the group—a nightmare for a self-conscious introvert like myself. Mercifully, Munson sensed my trepidation and let me off the hook, making recitation optional for my far-more-confident classmates. (Note to self: Study up on poetry.) Later that afternoon I’d mounted a stubborn, chocolate kiss-colored horse and tried in vain to herd a dozen rowdy calves into a muddy, narrow pen, learning in the process that desire alone does not a cowgirl make. But that’s not to say that this visit has been entirely spent in a state of fear or frustration. (Nor were those emotions unwelcome.) I’ve warmed my toes and sipped rich red wine in front of my very own fireplace. Paws Up presents guests a unique opportunity to saddle up and head out on a cattle drive alongside working ranch hands. I’ve been lulled to near-sleep at the spa with a Swedish massage while snow-capped mountains sparkled in the distance. I’ve snacked on after dinner s’mores by starlight. And I’ve sped alongside the Blackfoot River on an ATV, fresh Montana air filling my lungs and inflating my spirit. It’s that same ATV ride that has deposited me here at the ropes course, where, after what feels like an eternity, decision time has arrived. I close my eyes, recall each of the challenges I’ve encountered in this place and feel grateful—successful or not in my efforts—merely to have been shaken from the safety of routine. At last, I draw in one final big breath of that fresh Montana air and step forward. Whether it’s the cord or purely the spirit of this place that makes me feel safe in this moment, I don’t know. But I’m floating. I’m free.